Getting laid off can inspire you realize your dream, especially if that dream is not-banging Mena Suvari and getting crazy murdered by your neighbor. Realizing a different, tastier dream, Simple Sandwich. 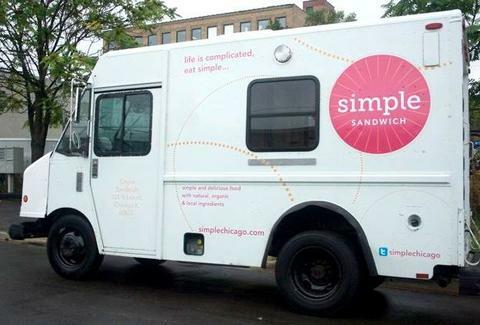 Simple's industry-vet honcho had been kicking around the idea of opening a sandwich shop for years, but wasn't able to get it done until he was liberated from a tech consulting gig; realizing his budget was tight, he decided to attack things truck-style, clearly having played enough Twisted Metal to know Mr Grimm's bike suuuucks. Made with local/organic products and served on French bollo bread, elevated standards run from roast beef w/ aged cheddar and balsamic-onion marmalade, to turkey w/ bacon, apples & Dunbarton cheddar blue, to nicoise olive-/lemon confit-topped bonito, which longs to be in San Pedro, instead of your sandwich. For cured meat lovers, there's giardiniera-Dijon topped salami and prosciutto rocking fig preserves & Seahive cheese, plus a chorizo/piquillo jam/roasted red pepper-topped grilled chicken, which after getting browbeaten about its road-crossing habits cried fowl. Rounding out the options're sides & sweets, from all-natural avocado oil potato chip, to chocolate chip cookies and banana bread, baked in house, a process that seems awesome until you start getting paranoid that Chris Cooper wants to kiss you.